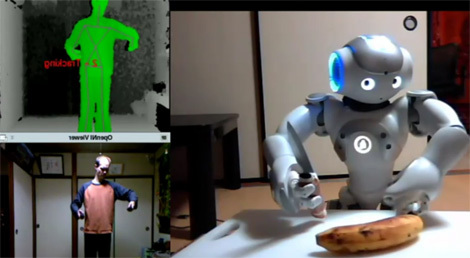 [Taylor Veldrop] has been playing with an NAO robot and ROS, mixed with a Kinect to get some pretty amazing results. The last time we saw any work done with ROS and the Kinect, it was allowing some basic telemetry using the PR2. [Tyler] has taken this a step further allowing for full body control of the NAO robot. Basic mimicking mixed with a little bit of autonomy allow the NAO to follow his steps around a room and even slice a bananna, or hammer nails. We think this is pretty impressive, especially if he were to mix it together with a motion tracking stereoscopic display. Follow along after the break to see it pull off some of these cool feats. I was soooo waiting for the robot to rage and stab his….’master’. I think the difficulties in picking up a knife might be a “safety feature”. NAO reminds me of observing someone who’s had a massive line of Ketamine!! You now the look, suprise at ones arms and the inability to control them! Great to see this little bot having fun! People are complaining about accuracy and such should actually play a kinect game, these applications are light years away from how an actual game reads your movements. Try kinect bowling and throw a curve, it doesn’t work so hot. Robots with knifes? I wonder how long until virus writers target virtual telepresence robots. When your telepresence robot stabs somebody, can you use the same defense as bit torrent users (the neighbor kids must have downloaded those MP3s — it wasn’t me!)? Absolutely amazing! I really enjoyed watching that. There was laughter, ‘aww’ moments, ‘oh noo’ moments, it was great. It’s like watching a child trying to do something. Adorable and really quite impressive. Even more impressive when you consider this is being done by a freelance guy. If he can manage this, imagine what a lab full of people could manage! Good guy, good video, good robot. One step closer to life like in ‘surrogate’. And a agree with most of the wall. Amazing work. Its downright creepy at times. I love it. The motions seemed pretty smooth and accurate, compared to what I was expecting. Am I the only one that noticed that due to the way the “eyes” are designed it looks like it’s always looking at the camera? Once I noticed this it got kind of creepy, especially with the knife. The first thing I thought when I saw this was Gundam, Evangelion, and Big O could be right around the corner after all. I follow Nao since the very beginning (even before the first announcement) and I really wait the day when it will be available. Most amazing is for me the fact that all this is just a clever chain of ‘off-the-shelf’ products with some mojo in between. No tenthousand dollars dev kits, DSPs and FPGAs… just what Santa brought your kids last Christmas (ok, the robot might stick out). Sure lot of room for improvements but its placed on hackaday not on engadet (not that products there would need no improvments)…. BTW… Tatami mats, sliding doors…. JAPAN!!! 3600 euros is equal to 4933 us dollars.. that’s a bit high to become part of the group of devs..
albeit the robot seems awesome I just think one could be built at home for less and you wouldn’t have to jump through all the hurdles imposed by the program and none of the commitments either. Oh cool. Though, seeing this – only a matter of time the little bugger decides (or gets hacked) to cut the owners achilles tendon and stab the guy into the neck. This is incredible. How long did it take you to create this? I think it would be very hard to build your own robot that can do all that, Aldebaran has a 50 people doing R&D on NAO!